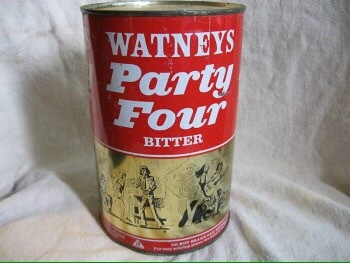 Anyone not raised in Britain in the 70’s is probably not aware of the horror of watneys beer. Usually we also had to rely on something equally awful and stronger to get any level of intoxication, Clan Dew was a favourite of mine which was some sort of whisky based drink. How much does the can hold? Could be 500ml or a gallon! Im not sure but the party four was quite portable, I suspect it might have held four pints, it certainly was never enough for four people to party on !